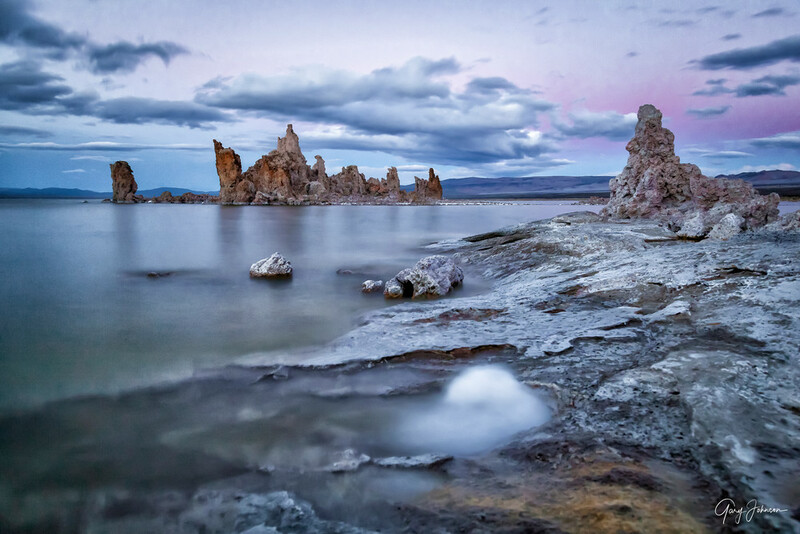 This image was photographed at Mono Lake near the town of Lee Vining, California. The name of this tufa formation in Mono Lake is called “Ghost Ship”. I was mostly attracted to the water as it lapped up on to the shoreline, then I noticed the white foam in the water. The foam tended to swirl around as the waves pushed in from my left one after another. By choosing to take a 30 second exposure it allowed the foam to start looking a little ghost-like. The purple colors in the sky added to the overall feeling of this dynamic scene. I loved the combination of the white foam mixed with the colorful rocks, the stormy clouds, and the purple sky. I printed it on metal to enhance the reflections on the glass-looking water.